We’re all drawn to water. Whether it flows over a waterfall, babbles in a stream or burbles soothingly from a fountain, the sound of water brings a whole new sensory experience to your home in Wayne, Phoenixville, or Gilbertsville. In addition to adding value to your home, they bring beauty, encourage relaxation, drown out unpleasant noises, and become an attractive focal point while sitting on your patio. 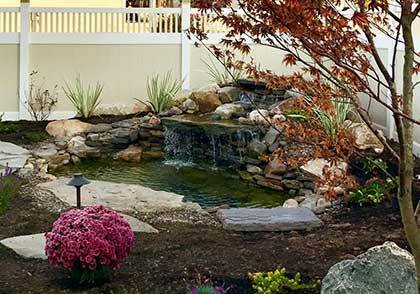 Learn why you should incorporate a water feature in your outdoor living area. At Whitehouse Landscaping, we can design and install natural stone water features, waterfalls, fountains, koi ponds and bubble rocks. There’s a water feature for every budget, space, maintenance requirement and personal style. Many homeowners have worked with Whitehouse Landscaping to add a water feature as part of their landscape design. Contact us to start your own custom water feature design process and see how we can transform your Chester or Montgomery County backyard to a place that the family gravitates to relax and unwind.